Relive your pastime with the Cooperstown Collection. 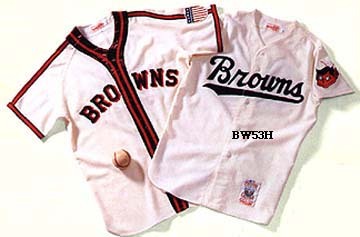 Major League Baseball has entrusted Mitchell and Ness exclusively with the responsibility of accurately portraying MLB's history through the evolution of the baseball uniform. The wool flannel/polyester knit shirts are contructed to meet authenticity guidelines. The premiere product line for autograph signings, framing or just wear to the game.. You'll surely stand out in your nostalgic apparel. 'The following chart is a helping tool in choosing the wool flannels worn in the pre 70's era. weight range 125-140 lbs. 141-169 lbs. 170-195 lbs. 196-220 lbs. 221-245 lbs. 246-270 lbs.